For beekeepers a normal bee year is from september till august the following year. I tried to make a short overview for myself. This calendar is based on the climate in the netherlands. I live near amsterdam so if you check a map of the earth you can see we have a tempered climate. A beekeeping season for someone who lives in a tropical climate is different than somebody who lives in norhtern europe. But nonetheless you can get a image on how the hive behaves during a year. The new season start with evaluating how the previous season has ended in late august. Normally in this period the hives are almost at their strongest, because the summer has recently ended and there are still a lot of bees available in the hive. The beekeeper has to consider if the beehive is strong enough to survive the upcoming winter period. If this is not the case, the beekeeper can decide to combine weak hives with each others. For example if a hive swarms late in the season. The new swarm can be too small too start the winter and survive it until spring. If there are not enough bees in the hive, it takes more energy for the bees to maintain the heat and change of survival diminishes. The bees start to notice the summer honey flow has recently ended, days are start to shorten and the temperature starts to plummet. These occurrences trigger a response and the bees start to prepare themselves for the upcoming winter. Trees and flowers are overblown and start making seeds, so most flowers and trees can not produce any more nectar or pollen. It is important for the bees to have already sufficient feed supply available. End of july and begin august the first winter bees are born. Vital winter bees are important, they enlarge the change of successful survival through the winter. Sufficient pollen and honey should be available to raise the winter bees. Fewer drones are born when the winter is approaching. The worker bees start to throw out the drone larvae and the mature drones will be exiled. Drones try to get back into the hive but the worker bees refuse them to enter. The drones will soon starve to death. If the beekeeper notice a hive has not enough honey to survive the winter. Sugar syrup will be fed to the bees. The bees start to process the sugar and store this in the honey comb next to the other honey. If the cell is full, the bees cap the ‘sugar honey’. It is the responsibility for the beekeeper to prepare the hive for the winter. Bees can not always collect enough honey to survive the winter. During a year you have important honey flows. In the netherlands the Linden tree is very important source of nectar in the summer (the linde tree blossoms around end may till end june). In recent year we had a lot of rain and the nectar could not be collected by the bees. We could not harvest any honey from the hives and we had to feed the hives with excess sugar to get them through the winter. Be aware sugar must be fed when the temperature is still moderate. If the nights become too cold it is harder for the worker bees to process the sugar. It is very important to check a final time on food amount. Last fall I was certain the bees were ready to start the winter. But when my final inspection was done. It occurred two hives were not ready, because of excess brood. They used a lot of feed to expand the winter colony. Fortunately it was still warm enough to feed them extra. Temperatures start to drop, and the last winter bees are born. The bees are almost ready for the winter. It depends for each hive when the last winter bees are born, for each hive it can differ a few weeks from each other. When brood is available in the hive, the constant temperature is around 32-36 °C. For the hive it is beneficial to be ready early in fall with preparing for the winter. If the temperature drops the worker bees take more food to regulate the hive temperature. When the last winter bees are born and winter is approaching. The queen bee stops with egg laying and bees are starting to move closer together to form a cluster. Brood is not available within the hive. The temperature within the hive drops to 13 – 18 °C degrees. Inside the cluster the queen bee is located. Bees start often in front of the hive and slowly shift to the back to follow the food supply. A critical temperature for a bee is 8-9 °C, with this temperature the bees paralyzes. During severe winters the queen bee can stop laying eggs for a few months. Beekeepers take the shortest day as a milestone for the winter. The days start to lengthen again and the queen bee start laying more eggs (queen egg laying starts end of december/ beginning of january). The amount of brood rearing is dependent on the amount of pollen and honey stored. If the hive has insufficient pollen supplies it will postphone the brood rearing or the size of the brood nest is smaller. After a long winter the activity in the hive starts to increase. When the opportunity arises on a beautiful spring day (temperature above 9 °C) the bees fly out of the hive for their cleansing flight. During the winter the bees eat honey, which have non consumable parts in them. Bees do not defecate within the hive, but will detain their excrement during the winter. The cleansing flight is the first opportunity to ease themselves from the stool. The first flowers start to blossom and the winter bees will start foraging to replenish their strengths. As the temperature rises so does the foraging area. After the first nectar and pollen starts to come in. The queen will expand the brood nest and the hive starts to grow again. The bees start building new comb after the hive expands. Drone eggs are being laid,which are needed later in the season to propagate the new virgin queens. In late spring the hive becomes stronger and winter becomes a dim memory. The first honey flow is already progressing and the bees are taking full advantage of it. The hive starts rearing new queens and slowly start preparing the hive for swarming.. 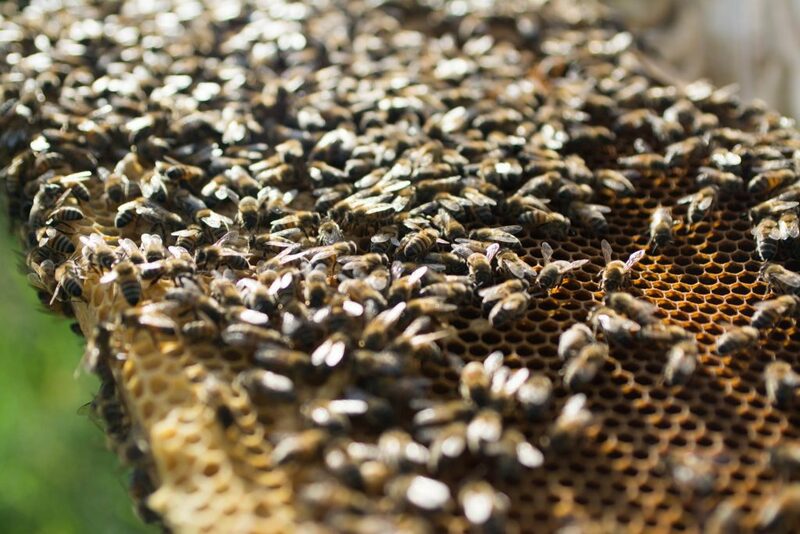 The longest day is approaching, the size of the hive is almost at its peak and the bees are right on track to benefit from the main summer honey flow. After the longest day the bees start slowly to prepare themselves for the winter. The end of the summer is approaching and the cycle is is almost finished and ready to start over again. Every year around february the bee fever hits me again. I am excited to start working again with the bees in a new season. Time really flies during bee season and before you know it it is already over. to give a short overview on the bee cycle, below the highlights during the year by month. This is based on the netherlands and could differ of course in your area. September: For the beekeeper the last change to feed the bees with extra sugar and do the last preparations before the bees go to winter rest. October: Queen bee stops or reduces her egg laying. November: The last winter bees are being born in the already colder nights. Bees start to move to each other to form a cluster. December/ January: After the shortest day the beekeeper will get excited for the new season. unfortunately still far away. the queen bee starts laying eggs to replace the ceased winter bees. February: when the first good spring day arises the bees will fly out for their cleansing flight. March: The first flowers are blossoming and the bees will slowly regain its strength from the winter losses. May: The hive will swarm and split into two. June: Longest day is approaching and the summer honey flow is in full swing. July: Bees prepare themselves for the upcoming winter. August: Brood nest reduces in size and winter bees are getting born.